I had always wondered what all the hype was when reading posts on Facebook and other blogs about Strawesome straws. So I contacted them myself and got a sample for my own reviewing purposes. It took a little while to get used to the size and the fact that it was not plastic that was bendable like throw-away straws. But after a few uses I got a little more used to it, so I gave it to my son to test out. (Yes I tried it out myself before sharing) : ) He was really afraid of it breaking when he was using it, but I reassured him it would not easily break, especially while just drinking through it. I think I would like the bent straws a little better than the straight version, I find myself bending plastic straws even when they aren't the bendy kind. I was amazed at all of the great patterns and styles I found on the Strawesome website. They offer Decorative Straws, Colored Straws, Bent Straws, and more! Concern about plastic usage is at an all-time high. Glass drinking straws are one way to limit your exposure to toxins from plastics because they're toxin-free! No BPAs, phthalates, etc. If you use straws a lot, think about how many plastic straws you throw in to a landfill every year. Including the instances you dine out at restaurants this number can be astronomical! Being green has never been so easy. Replacing your disposable plastic straws with a glass straw is one little thing you can do to help save our planet. The feeling of glass on your lips will help you lose weight on your hips! Not only is it fun to drink from a glass straw but studies have shown that drinking from something more substantial than plastic may help you lose weight. Strive to consume more water? Make it fun with a glass straw. It really works! Want to help your kids eat more fruits & vegetables? Make it fun with a green smoothie and a glass straw. According to speech therapists, glass straws help kids with oral development making it easier for them to learn to articulate and pronounce words. Jaw wired shut or have a hard time eating without a straw? A glass straw might do the trick! Has your dentist mentioned teeth staining? Use a glass straw to have your beverages bypass your teeth when you drink coffee, tea, red wine, or any acidic beverage and then see what your dentist says at your next checkup. If you are a smoothie lover, guess what? Yep! Glass straws make smoothie consumption a whole 'notha experience. Perfect for the green smoothie, protein shake, or any thick beverage! Want a gift for the person who has everything? 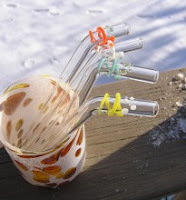 Buy them a personalized glass straw from Strawesome. Drinking straws are great gifts for special occasions like bridal showers, baby showers, weddings, or corporate gifts. Buy it: You can find Strawesome straws online or a at a few select retailers. Giveaway CLOSED - Congratulations to the winner (Heather Honey) you have been notified via email and have 48 hours to reply or a new winner will be chosen. Win it: One lucky reader will win their choice of a regular or smoothie decorative straw. This giveaway will end Jan 30th at 10 PM EST. The winner will have 48 hours to respond to my email. If no response, a new winner will be chosen. Open to residents of the US only. Visit Strawesome and tell me your favorite straw color/design/style. Party Time Smoothie Set of 6 would be great! Fun colors and enough to share. these are super cute! I love the just for kids straw. I like how they are bent. thanks! How unique! I like the Funky Family Set! I like the Bent Skinny Straw. I follow Strawsome on Facebook. I like the Funky Family Set! I like the cobalt blue straws and the kids bent straws are cute. From the Strawesome website I would LOVE the Party Time Regular Set of 6, that's my favorite, but as a single straw, the Winter Bliss Smoothie Straw is beautiful. I follow Strawesome on Facebook. Also posted to FB! Thanks for the opportunity to win! I like the party time set! So cute! The amethyst smoothie straw looks great! I like the rhapsody bent straw. I am already a friend of yours on FB. follow this blog publicly via Google Friend Connect. I love the funky family set! I adore the Extra long bent smoothie straw! I haven't seen these straws before and wasn't expecting to have such a hard time choosing one. I do like the Fade to Pink Extra Long Bent Skinny Straw. I love their Just for Kids Set of 4 in any color or combo! My son loves drinking out of straws and I hate just throwing them away. i like the party time smoothie set of 6! following on twitter, i am "goochin"
following on facebook, i am "cash smith"
Love the idea of the smoothie straws - my fiance makes them almost every morning and I always end up with it all over my face! The Subtly Teal Bent Regular Straw is my favorite. I like the Funky Family Set. I like the funky family set. Thanks for the opportunity to win. I love the Be My Valentine Smoothie Straw, perfect for our nighttime snack!! I love the just for kids set! I love the Big Daddy Bent Straw! I love the dynamic duo decorated straws. I love the Meteor Long straw - gorgeous! I like the big daddy bent. I like you on FB. mary Jaco. Like Strawsome on FB. Mary Jaco. I like the funky Family straws! I love the Be My Valentine Smoothie Straw. So cute! I follow you with gfc (psychdog). I like the Funky Family Set...a little something for everyone! I have been in the market for a reusable straw! I have been into raw foods and make smoothies every day. Smoothies are just way more fun to drink with a straw.